Here's a sneak peek of my new faux suede collection! The Patchwork Messenger bag pictured above is made from four different colors of premium faux suede in lilac, olive green, truffle and chartreuse. Anytime I purchase new fabric I make a swatch to save for future reference. When I saw all my swatches next to each other I was inspired to use all four colors to create a bag. So that is how the patchwork bag evolved. I also have a newly designed shoulder bag coming and more Wayfarer Purses. They should all be available in the Pesky Cat Designs shop late afternoon. 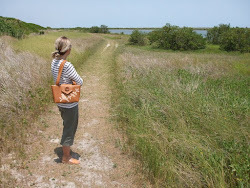 Today my Nautical Wayfarer Purse made it to Etsy's front page! It has been a while since I thought of warm weather and sunny skies since NYC has been cold and rainy for days. This treasury definitely warmed up my day and put a smile on my face. Thank you TheBrassHussy for creating such a lovely list and including my purse! 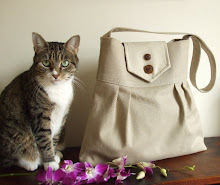 A new collection of handbags made from premium faux suede fabric are coming to the Pesky Cat Designs studio! The fabric samples posted above are some of the colors that will be available. I'm also working on revising some of my designs and adding a new creation. In case you are wondering about my Harris Tweed Collection, more is one the way. I'm ordering more fabric directly from the Isle of Harris! Stay tuned! I created a couple of new purses made from Harris Tweedwool and will be adding them to my shop this afternoon. The purse above is made from a barleycorn weave in blue, gray, brown/red and cream. I added a leafed branch applique in blue that coordinates beautifully with the tones in the purse. I purchased this luxury cloth at my local fabric shop in NYC and it was the most I ever spent on a textile. But I think it was worth every penny! Today I have silver on my mind, more specifically a beautiful silver ring. These striking designs are created by some of my favorite Etsy artists. I'm very drawn to organic shapes and works inspired by nature. These unique silver designs are just stunning and I'm dreaming of having them all in my personal collection. Check out the shops for more gorgeous creations! This week I completed a couple of bags using a combination of plaid wool and corduroy. They will be available in my shop this afternoon. I love how the two winter textiles work together. I also purchased some Harris Tweed and can't wait to get started with it in my studio. More plaid creations are coming soon as well! I know that Autumn has only begun but the cooler weather in NYC has me thinking of the upcoming winter season. Boots, coats and pretty soft warm scarfs come to mind. I love winter attire although I prefer warmer weather if I had a choice. Recently I had a customer inquire about a possible custom order bag in an off white corduroy. I decided to purchase a few yards of cream and winter white online. I usually order swatches before committing to buy but since it was a small quantity I decided to take a risk. When my package arrived I was a little disappointed to find that both fabrics I ordered where pretty much the same color. Now I have lots of winter white corduroy in stock and already added a purse to my shop created with my winter inspired textile!